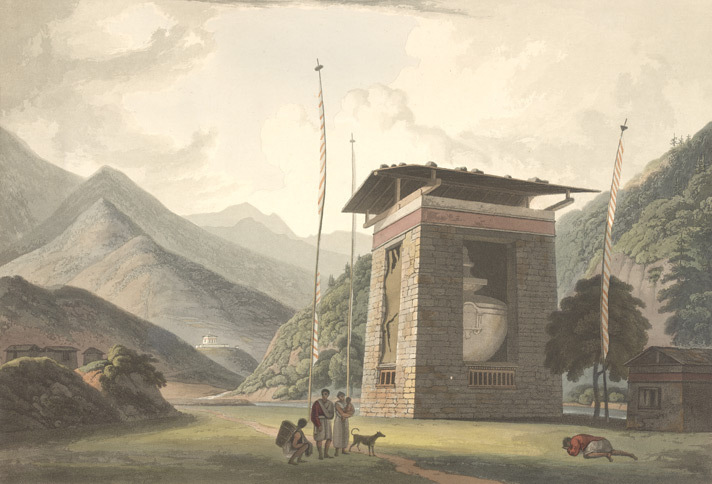 In 1783, British East India Company Captain Samuel Turner set out from Calcutta towards Tibet, travelling via Bhutan. Surveyor-soldier Lieutenant Samuel Davis joined the Tibet mission. The group arrived at "Tassisudon" in June of 1783 (exactly 230 years ago) and stayed there for three months. Davis was a talented artist: his detailed sketches and journals carefully recorded his impressions of a country rarely explored by Westerners. Thirty years later, English landscape artist William Daniell created six engravings based on original drawings by Samuel Davis. The series of etchings, titled 'Views in Bootan', was publsihed in June, 1813 (200 years ago this month). 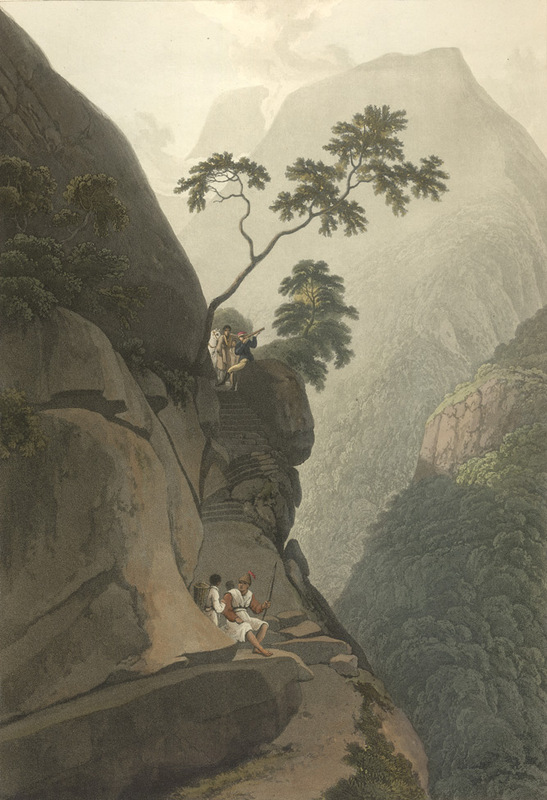 William Daniell had not been to Bhutan himself so he would have used some artistic license to bring life to his work. It can be said that the landscape and architecture elements are realistic though romanticized. However, the picturesque, pastoral figures are the standard formulaic inhabitants of colonialist-era engravings. There are two people wearing those backpack-baskets that are very Bhutanese and two red robed monks, but everyone else looks like an ancient Roman. If you love these engravings and want to own the book, you are in luck! One original 1813 copy of 'Views in Bootan' is for sale priced at £48000/$75,000. The following six plates and text are copyright to The British Library Board. All of these prints were featured in Michael Aris' "Views of Medieval Bhutan: The Diary and Drawings of Samuel Davis, 1783". This looks like a fascinating book but I cannot find a copy of it anywhere so I was delighted to discover that the etchings are available in the British Library online gallery. 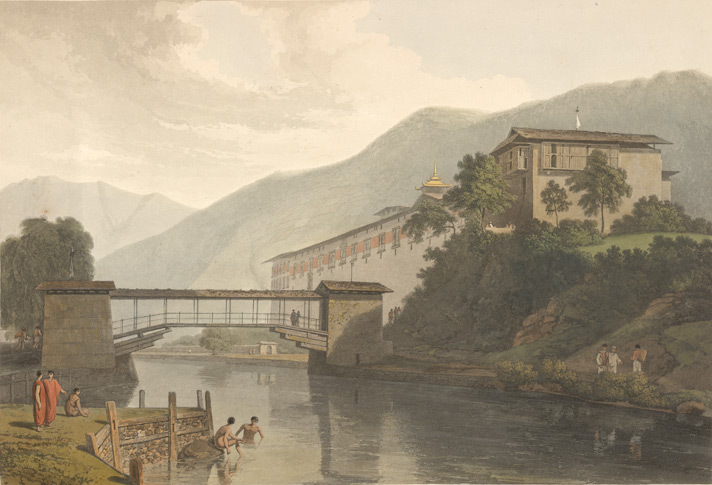 "In the fourth stage of their journey into the mountains of Bhutan, the British detachment arrived at Chukha Dzong, "a lofty and spacious edifice, situated on a bare rock, and commanding the passage of the river". 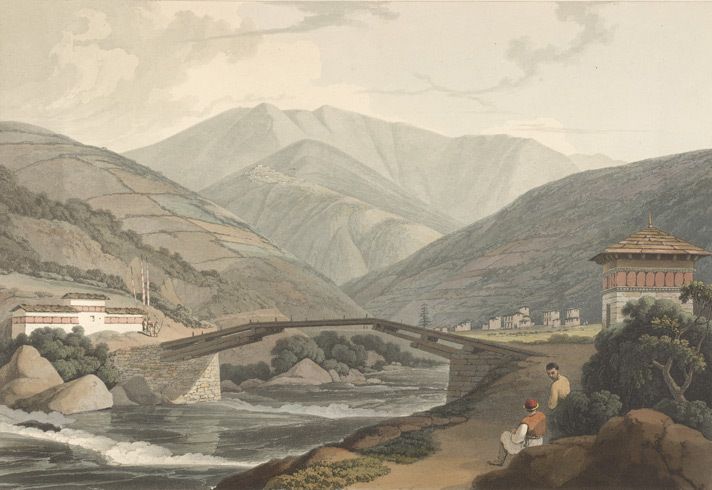 To reach the fortress, they crossed Thimphu Chu by the bridge of iron chains on the left side of the view. The fortress itself was composed of three buildings around a courtyard, an excellent defensive structure in a region so difficult to penetrate. After their sojourn here, Turner's group made their ascent of the hill seen in the middle distance. The vegetation changed from the tropical type they had seen in Bengal to fir forests and beds of wild strawberries and roses, and the climate became chilly." "This view shows the house where the British detachment was lodged, "simple, unostentatious but clean and commodious". Its projecting balconies were secured from the cold by Bhutanese woollen cloth and used as sleeping apartments, with a fine view of the Thimphu river valley. The rapidly flowing river was apt to swell in the rainy season, necessitating the shoring up of the embankments. 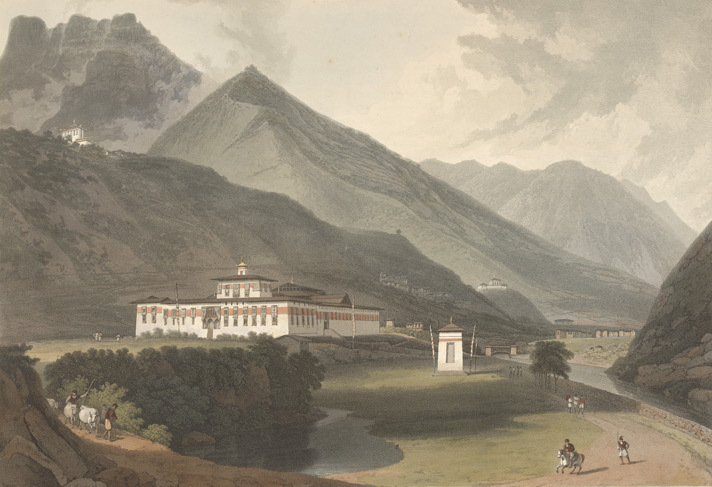 In the sketch the Tashicho Dzong is partly obscured by a peach tree. The bridge led to a meadow ornamented by willows planted in neat rows, where priests from the Dzong (two of whom are seen in their red wool robes) gathered for ceremonies and recreation." "The Bhutanese system of administration was established by Ngawang Namgyal, a monk of the Drukpa sect, who had fled Tibet in 1616. He united the chieftains of Bhutan, who had hitherto ruled independent principalities as Debs or Rajas. Taking the title of Shabdrung, he established a series of fortresses, or Dzongs, in Bhutan's valleys, seats of both temporal and spiritual power. Tashicho Dzong, the fortress of the Deb in the Thimpu valley, was one of the most stately. On the hill to the left in Davis' sketch is the Deb's villa. Near the Thimphu river is seen a Buddhist chorten (temple). Bhutan held access to important passes deep into the Himalayas. Captain Turner's group, of which Davies was a member, arrived here on the eighth stage of their journey to Tibet. To them, "this edifice and clusters of houses and well-cultivated land produced a favourable contrast to the wild and solitary aspect of the country through which the embassy had advanced." "[Samuel] Davis portrays a temple known as a chorten, which is flanked by tall prayer flags known as tall dashis. The flags are inscribed from top to bottom with the sacred Buddhist mantra 'om-mani-padme-hum'. In the distance is a Rajah's small villa. 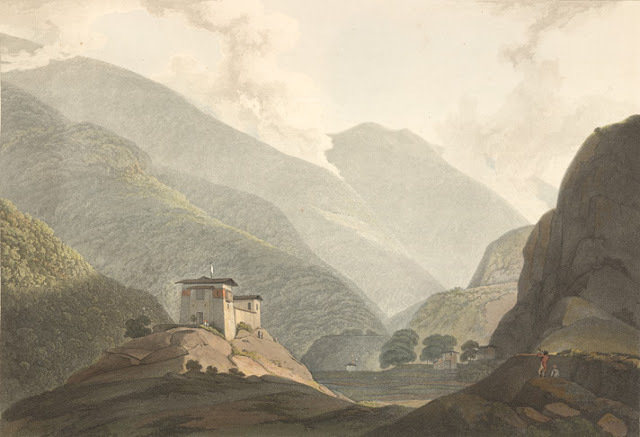 Davis, a keen amateur artist, was in service with the East India Company and accompanied Samuel Turner's embassy to Tibet in 1783, but did not proceed beyond Bhutan." "The river Thimphu Chu (or Wang Chu) descends rapidly towards Bengal. This view was made some three miles below the Tashicho Dzong, the valley's mighty 17th-century fortress that today houses Bhutan's National Assembly and the King's throne room. It is also the summer residence of the Je Khenpo or the religious head of the Bhutanese. The bridge in Davis's sketch looks insubstantial, but in fact it was 15 feet wide. The accompanying text reads: "The building on the foreground was converted into a post to command the passage of the river, in the course of the insurrection which happened when the Embassy was at Tassiduon." In the village on the summit of the central hill lived a fraternity of gelongs - Buddhist novice monks." "The mountains in this part of the road appear as if separated by violence to give a passage to the river Teenchoo [Thimphu Chu]. The side up which the road ascends is precipitous, and of an height to render the climbing of it intimidating to those less accustomed to it than the natives." As the British climbed the thickly wooded inclines, "the hoarse murmurs of the Teenchoo are heard, though the river is not always seen as the traveller ascends". Thank you for another round trip to our past. Interestingly, the costume our people wore those days was not Gho or Kira, it was something else, and our history has no record of it. It has close resemblance to Droyaps' (people living in southern Haa)costume. This is basically the first time I've read about the history of Bhutan and I can't help but think that the nation's so lucky for their past to be illustrated. It's great knowing these things. Thank you for sharing!